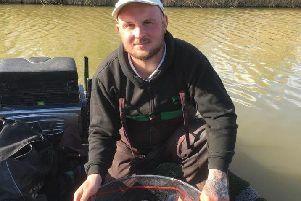 Tony Dawson was a double winner at Rookery Waters. This year’s HAJAC Winter League hasn’t been the most productive of competitions but at least it finished on a reasonable note. Those fishing the final round of the series on Ramsey Narrows certainly had a good day’s sport even though some of the other sections spread around our Fenland waters didn’t fare quite so well. Ian Benton topped a good quality field with 26lb 3oz. He drew three pegs down from the Ramsey Forty Foot bridge on the Narrows. A slow start saw him take a few small fish on pinkie but then he managed to get a decent tench out on his light rig so that was the signal to switch to his chopped worm line with a much more robust approach. The tactics paid off as he went on to net a further six tench. In the same section was runner-up Dan Jones. He had a good net of rudd taken from the bridge peg and topped them up with a tench which saw him finish with 15lb 10oz. On the team front a masterly display of Fenland drain fishing saw Maver Image romp home on the day with just 12 penalty points. Runners-up were Sensas Tackle and Bates on 20 points and that was enough to see them top the league after four rounds on seven points. Second overall were Stanjay Gold on nine points followed by Maver Image with 13. Top individual was the consistent Alex Bates on five points. There were was some good sport to be had for those fishing the Rookery Waters Over 60s midweek match on the Magpie Pool. Top rod was Tony Dawson who caught carp to 3lb to finish with 57lb 12oz. Pushing him all the way was local rod Dave Rawlings. He fished bread tight over to the island but fell just short with 56lb 10oz. Third place went to John Belshaw who weighed in 44lb 10oz. Fishery expert Tony Dawson made it two wins on the trot at the fishery, winning the latest Winter Qualifier Open on the Magpie Pool. Once again he pulled hot peg one out of the bag and made no mistake finishing with 37 carp for 92lb 12oz. Dawson started fishing bread into the corner then switched to his sweetcorn line tight up to the lillies. Tony McGregor filled the runner-up spot. He fished the long pole and was kept busy all day fishing sweetcorn netting small carp to weigh in 79lb 14oz. There are just two more qualifying matches before the final takes place on March 26 and 27. So if you fancy your chances of winning a big cash jackpot then you would be advised to get booked in as soon as possible as places will be limited. We are fast approaching the end of the coarse fishing season on Fenland waters and rivers across the country. In fact this weekend will be your last chance to get out on our local venues as the season closes at midnight on March 14. The new season opens on June 16, so best to make a note of those dates as you do not want to be caught fishing out of season, no matter how you feel about a long overdue review of the fishery by laws.